Lunchables Get Mixed Up Instant Win Game – Win a trip to Australia! ELIGIBILITY – Game is open only to residents of fifty (50) United States and the District of Columbia between six (6) and seventeen (17) years of age at the time of entry. SWEEPSTAKES PERIOD – Game begins at 12:00 am ET on August 1, 2014 and ends at 11:59 pm on January 31, 2015. 1, 2015 and December 31, 2015 or prize will be forfeited.ARV:$25,360. Three thousand (3,000) First Prizes: A $25 Toys”R”Us digital gift code, a $25 Amazon.com Gift Card ditigal claim code, or a $25 Discovery Channel Store digital gift code. ARV: $25. Six thousand (6,000) Second Prizes: A $10 Amazon.com Gift Card digital claim code, a $10 iTunes digital gift code, or a $10 Redbox digital gift code. ARV: $10. One hundred thousand (100,000) Third Prizes: A $5 Amazon.com Gift Card digital claim code. ARV: $5. 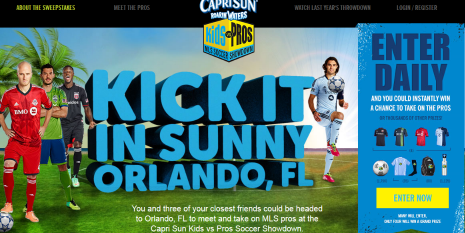 Capri Sun Kids Vs. Pros MLS Soccer Showdown Sweepstakes – Win a trip to Orlando & more! Win a trip to Orlando, FL where you will attend a MLS event and have an opportunity to play with the MLS players (4 winners)! ENTER SWEEPSTAKES HERE – Capri Sun Sweepstakes page. ENTRY LIMIT – Limit one (1) Game play per day per username. SWEEPSTAKES PERIOD – The Capri Sun Kids vs. Pros Instant Game begins at 12:00 pm ET on July 28, 2014 and ends at 11:59 pm ET on November 30, 2014. PRIZES – Four (4) Grand Prizes Are Available To Be Awarded (each, a “Grand Prize”). Each Grand Prize winner will receive: a trip package for winner and up to seven (7) guests (the winner and each guest must be accompanied by a parent or legal guardian who are included in the seven (7) guest limitation) to Orlando, FL. Trip package shall include: (i) round trip, coach-class air transportation for up to eight (8) from a major airport near winner’s home (determined by Sponsor in its sole discretion) to Orlando, FL; (ii) three (3) nights’ accommodations at a hotel determined by Sponsor in its sole discretion (four (4) rooms, double occupancy); (iii) attendance at an an MLS event where winner and guests will be able to play with the MLS players (MLS players subject to availability); (iv) ground transportation between hotel and airport and to and from the hotel and MLS event; and (v) $3,500 spending money for winner only. Winner and guests must travel between January 1, 2015 and May 31, 2015 on a Sponsor determined date or Grand Prize will be forfeited. Approximate Retail Value (“ARV”) of Grand Prize: $17,210. Four (4) First Prizes Are Available To Be Awarded (each, a “First Prize”). Each First Prize Winner shall receive: an MLS team soccer jersey. ARV of First Prize: $64.99. Thirty five (35) Second Prizes Are Available To Be Awarded (each, a “Second Prize”). Each Second Prize Winner shall receive: an adidas soccer jersey and Capri Sun Soccer socks. ARV of Second Prize: $52.90. Eighty (80) Third Prizes Are Available To Be Awarded (each, a “Third Prize”). Each Third Prize Winner shall receive: an adidas soccer backpack. ARV of each Third Prize: $25.70. One thousand one hundred twenty five (1,125) Fourth Prizes Are Available To Be Awarded (each, a “Fourth Prize”). Each Fourth Prize Winner shall receive: a water bottle. ARV of each Fourth Prize: $8.30. One thousand seven hundred fifty six (1,756) Fifth Prizes Are Available To Be Awarded (each, a “Fifth Prize”). Each Fifth Prize Winner shall receive: a regulation soccer ball. ARV of each Fifth Prize: $7.03. Limit One (1) Grand Prize as well as one (1) First, Second, Third, Fourth, or Fifth, Prize per person, family and per household. 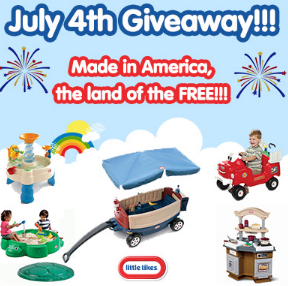 Little Tikes “July 4th Giveaway” Sweepstakes – Win Little Tikes products! Win some pretty awesome Little Tikes products (see the list below)! ENTER SWEEPSTAKES HERE – Little Tikes Sweepstakes page. ENTRY LIMIT – You may enter as many times as you wish. Extra entries will be earned by following any of the “extra entry” requirements listed on the contest page. ELIGIBILITY – The Contest is open to legal residents of the contiguous United States where not prohibited by law, who are eighteen (18) years of age or older at the time of entry who have Internet access and a valid e-mail account prior to the beginning of the Contest Period. SWEEPSTAKES PERIOD – The Sweepstakes begins at June, 27, 2014 1AM PST and ends at July 4, 2014, 11:59PM PST. DC Entertainment The LEGO Movie Prize Pack Sweepstakes – Win the LEGO movie & more! Win a LEGO movie prize pack (includes The LEGO Movie, LEGO Batman 2 for XBox 360 and PlayStation, The LEGO Movie Soundtrack and more)! ENTER SWEEPSTAKES HERE – DC Entertainment Sweepstakes page. ENTRY LIMIT – Only one (1) Entry per email address or household is allowed per calendar day during the Sweepstakes Period. ELIGIBILITY – This Sweepstakes is (1) open to legal residents in the 50 United States and the District of Columbia who are 13 years of age or older and have Internet access; (2) void in Puerto Rico, the U.S. Virgin Islands, U.S. Military installations in foreign countries, all other U.S. territories and possessions and wherever prohibited or restricted by law; and (3) subject to all applicable federal, state and local laws. Entrants who are not of the age of majority in their state of residence (“Minor”) must have their parents’ or legal guardians’ consent to participate in the Sweepstakes and such entry will be deemed to have been submitted by the Parent. SWEEPSTAKES PERIOD – This Sweepstakes begins on 6/18/14 at 12:01 a.m. Pacific Time (“PT”) and ends on 7/2/14 at 11:59p.m. PT. 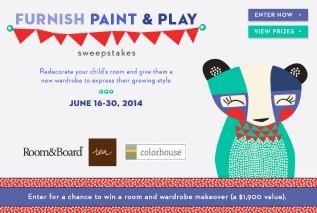 Tea Collection “Furnish Paint Play” Sweepstakes – Win a $500 Tea Collection gift card & more! Win a $500 Tea Collection gift card, a $1,000 Room & Board gift card and a color consultation from Colorhouse, plus 4 gallons of Colorhouse paint! ENTER SWEEPSTAKES HERE – Tea Collection Sweepstakes page. ELIGIBILITY – The “Furnish Paint Play” Sweepstakes is open to legal residents living in the continental United States (excluding Rhode Island) and the District of Columbia, who as of June 16, 2014: are at least 18 years of age; have internet access; and have an email account. SWEEPSTAKES PERIOD – Sweepstakes entries can be submitted starting at 12:00 am PT on Monday, June 16, 2014 and ending at 11:59 pm PT on Monday, June 30, 2014. -A 1-hour online color consultation from Colorhouse, including a Colorhouse fan deck of color swatches and 4 gallons of Colorhouse paint. Approximate retail value (“ARV”): $400. Total ARV of the Grand Prize is $1900.00. National Geographic Kids Outside Activities Sweepstakes – 25 winners! Win a kite, a water balloon launcher, a snorkel set, sunglasses, a pet’s eye view camera, a Nat Geo Geographic Expedition Trekking pack, night vision goggles, mini binoculars and a tent (25 winners)! ENTER SWEEPSTAKES HERE – National Geographic Kids Sweepstakes page. ENTRY LIMIT – LIMIT ONE (1) ONLINE ENTRY PER PERSON PER DAY. ELIGIBILITY – The Outside Activities Sweepstakes is open only to legal residents of the 50 United States and the District of Columbia, who are age 6 -14 years of age and located in the U.S. at the time of entry. Parents may also enter in behalf of their children. SWEEPSTAKES PERIOD – The Promotion begins at 12:00 a.m. Eastern Time (“ET”) on April 7, 2014 and ends at 11:59 p.m. ET on August 1, 2014. Ride Schwinn Spring Cleaning Song Sweepstakes – Win a prize package worth over $700! Schwinn is giving away 5 amazing prize packs! See all the prize package details below! ENTER SWEEPSTAKES HERE – Ride Schwinn Facebook page. ENTRY LIMIT – Limit of one entry per person or email address every 24 hours during the Promotion Period. ELIGIBILITY – Open to legal residents who live in the 50 United States and District of Columbia, Canadian residents in a province (excluding any territory and Quebec) who are over the age of majority in their state or province of residence, at the time of entry. Must be 18 years of age as of March 15, 2014. SWEEPSTAKES PERIOD – Beginning March 14, 2014 on or about 2:00 p.m. through March 30th at 12:00 a.m.
Polaroid The Kids Tablet Sweepstakes – Win a Polaroid HD Kids Tablet! Win a Polaroid HD Kids Tablet (3 winners)! ENTER SWEEPSTAKES HERE – Polaroid Facebook page. ENTRY LIMIT – Limit one entry per person. Earn bonus entries by sharing your personal link with friends. ELIGIBILITY – The sweepstakes is open to all legal residents of the fifty (50) United States and the District of Columbia (“D.C.”) who: (i) are at least eighteen (18) years of age or older as of the day of entry; and (ii) have Liked the Polaroid Facebook Page by clicking the “like” button. SWEEPSTAKES PERIOD – The Kids Tablet Sweepstakes begins at 12:00:01 AM Eastern Standard Time (“EST”) March 10, 2014 and ends at 11:59:59 PM EST March 31, 2014. 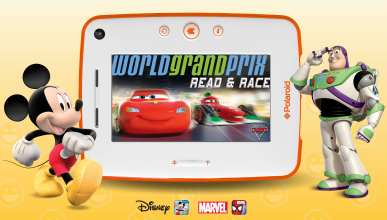 PRIZES – Three (3) Polaroid HD Kids Tablets will be awarded (the “Prize”) during the Sweepstakes Period. The Approximate Retail Value is $149.99 per tablet. AMC The LEGO Movie Giveaway Sweepstakes – Win LEGO sets and other prizes! 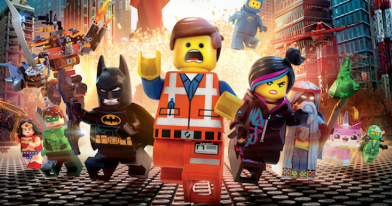 Win LEGO movie t-shirts, LEGO sets and other prizes! ENTER SWEEPSTAKES HERE – AMC Sweepstakes page. ELIGIBILITY – The Rules aren’t working, but usually these sweepstakes are for US residents age 18 or older. SWEEPSTAKES PERIOD – Rules not working – so don’t wait to enter-it could end soon! PRIZES – 2 Adult LEGO Tees! 3 “The LEGO Movie” Minifigure Blind Pack.